Apple iMac now comes in larger size. The new Apple iMac 24″, similar to previous iMac model with Intel Core Duo processor, features higher-end 64-bit Intel Core 2 Duo processor with speeds ranging from 1.83GHz to 2.33GHz with 4MB L2 cache. And of course, the 24-inch iMac comes with 24″ widescreen LCD flat panel display. 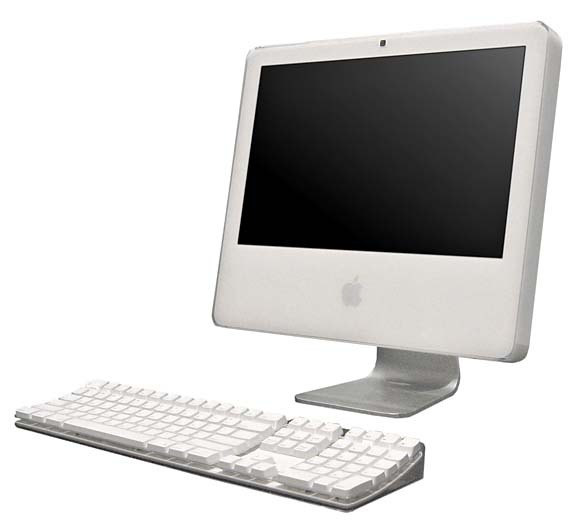 Apple iMac 24″ Core Duo also features Serial ATA 7200-rpm hard drive, NVIDIA 7300 GT graphics card, slot-loading 8x SuperDrive (DVD+R DL/DVD±RW/CD-RW) optical drive, FireWire 800, 24-watt digitally amplified speakers, and other standard Apple features with Mac OS X operating system. ComputerAct!ve (dead link) reviews 24-inch Apple iMac and concludes with rating of 4 out of 5 that if has gorgeous 24in widescreen display, decent graphics card and good bundled software, although it’s still fairly expensive. Overall, Apple’s new 24in iMac is expensive and extravagant, but utterly desirable. ComputerWorld (dead link) gives Apple iMac 24-inch a WOW factor and concludes that “if I were in the market for an iMac, is this one the I’d get? Given my penchant for computing speed and size, I’d have to say yes. Most users won’t notice a big difference from the extra 170 MHz. While I’m all for getting the fastest processor possible, I’d probably stick with the basic chip and the stock 250GB hard drive. I’d opt, however, for the faster video card with more video RAM and I might even go ahead and buy the additional 1GB of RAM I’d want from Apple. Here’s why: the iMac comes with 1GB of RAM, but it uses two 512MB RAM modules. To buy my own 2GB of RAM, I’d have to ditch the modules that come with the iMac and try to sell them myself. Yes, Apple’s RAM tends to be more expensive, but in this case, getting memory on my own from my usual third-party supplier is going to cost $284. Apple charges $175.” Rather than pay more now, and try to recoup some of that expense later by selling the 512MB modules, it’s just plain easier to let Apple do the work. PC Magazine concludes with rating of 4.5 out of 5 and selects Apple 24-inch iMac as editor’s choice with comment that if you need a high-powered all-in-one PC or replacement desktop, look no further than the new 24-inch Apple iMac. With Boot Camp, it will run Windows XP (and, we hope, Vista in the future), and as I expected, it’s a powerhouse running Mac OS X. Once Adobe comes out with PhotoShop/Creative Suite 3 and updates its other Intel-native apps, the iMac will be powerful enough to run a graphics arts business out of your home. As is, it matches or even beats older Power Mac towers for power.